Eat and sleep. Eat and slep. The monotony here kills you. 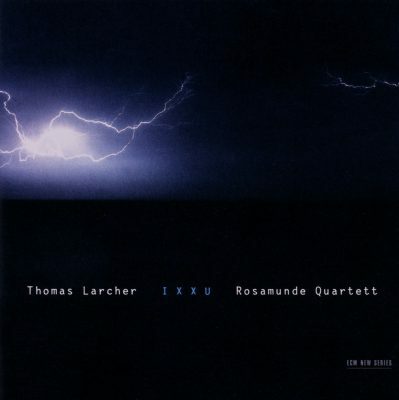 The title string quartet (1998-2004), for one, proves that Larcher’s is a unique compositional voice when such distinction is sometimes hard to come by. He is rhythmically astute, melodically complex, and simply tantalizing to listen to. High-pitched whispers make for organic contrast to the music’s underbelly, culminating in the final movement with haunting charm. Another string quartet, Cold Farmer (1990), ends the album in Hartke territory, with just a touch of Schnittke and Riley to be found in due measure. Its equal dose of whimsy and magical realism make for a composition that would easily fit into the Kronos Quartet’s repertoire, and which completes the frame around the album’s masterful center. In the hands of the ever-capable Rosamunde Quartett, these pieces glitter. My illness is the medicine I need (2002) for soprano, violin, violoncello and piano is indeed a most competent stroke in the realm of textual settings—these, medical patient statements found, of all places, in a Benetton Colors magazine. Soprano Andrea Lauren Brown embodies in its deft unraveling the very reenactment of a quantifiable cause, so that one’s illness indeed does becomes the only source for its cure. This is symptomatic music par excellence, and pairs well with Mumien (2001/02) for violoncello and piano. What begins as a staccato agitation ends up a handful of threads drawn into a single focused line. The rhythmic integrity of Larcher’s piano is a constant presence, while Thomas Demenga’s cello is the empathic observer, clarifying intentions with every turn of phrase. The music of Ixxu has the quality of certain nursery rhymes: on the surface playful, perhaps full of holes, yet betraying an amazing wealth of morbid fascination just beneath the surface. Make these your bedtime stories, and you won’t be disappointed.